Burkina Faso, formerly Upper Volta, is a small, poor, landlocked country in West Africa (see map). It is bounded by Niger to the east, Mali to the north and west, and Benin, Togo, Ghana, and Ivory Coast to the south. Part of French West Africa after 1896, Upper Volta became independent in 1960. The renaming of the country in 1984 dramatized its break with the colonial past. The new flag dates from August 1984 when the name of the country was changed from Upper Volta to Burkina Faso. Red stands for revolution, green for hope and abundance, and gold for mineral wealth. Distinctive aspects of the land have shaped the economy and way of life. Burkina Faso is located in the savanna zone on a granite and gneiss plateau some 200 to 300 m (650 to 1,000 ft) above sea level. The plateau is drained by the nonnavigable headwaters of the Volta River; these streams are a source of river blindness, a scourge to the inhabitants. The poor, semiarid soil supports few crops, produces low yields, and loses its fertility rapidly. The tropical climate has rainy (June-October) and dry (November-May) seasons, with rainfall averaging 1,015-1,270 mm (40-50 in) annually in the south and only 510 mm (20 in) in the north. Extreme variations in rainfall led to severe droughts in 1969-74 and 1981-83, with large losses of life and livestock. Temperatures range from 10° C (50° F) in the early dry season to 40° C (104° F) just before the rains. Vegetation varies by ecological zone: there are fruit trees and some forests and woodlands in the center, and desert flora and scrub vegetation in the north. Desertification is a serious problem due to fires, the cutting of trees for fuel and to clear land, and overgrazing. Between 1992 and 1997, the government invested about $7 billion to counteract the effects of deforestation and is working to create a green belt by planting millions of trees between the seriously eroded northern part of the country and the still-wooded southern part. There is great linguistic and ethnic diversity among the inhabitants (known as Burkinabe). The Voltaic linguistic grouping includes the Mossi (48% of the population), Grunshi, Bobo, Lobi, and Senufo). Mande-speakers include the Busani, Marka, and Samo and the Dyula, whose language is the commercial lingua franca. Other groups include the Fulani and Hausa. About 45% of Burkinabe adhere to traditional religions. About 50% are Muslims, a faith that was historically resisted. Roman Catholics form a small but influential educated minority. Most Burkinabe live in rural areas, where traditional leaders remain influential. The extended family and clan are the basic social units. Drought and population pressures in the south have increased the flight from the land and accelerated the traditional emigration of young male Burkinabe to the plantations and cities of the more prosperous Ghana and Ivory Coast. Many of these migrants never return, reducing the Burkinabe labor force (and thus economic growth) and leaving women as the key producers in agriculture. In recent years, in an effort to provide power for industrial growth and water for irrigated agriculture and fisheries, several major hydroelectric dams have been built. The largest is the new Diebougou Dam, south of Ouagadougou. Ouagadougou has four times as many mopeds as cars. The people of Burkina Faso can claim to be the biggest moped users on the continent. Ouagadougou, the capital, and Bobo Dioulasso, the home of the Bobo people, are the two largest cities. Ouagadougou has become known internationally as the site of the biennial pan-African film festival (FESPACO), begun in 1969; an African film library was opened there in 1995. The wide dispersal of the rural population and the preference of the educated for city life make efforts to provide schools, health facilities, and other rural services very difficult. Poverty and lack of access to health care give the country one of the world's lowest life expectancies and one of its highest infant-mortality rates, despite the launching of successful mass campaigns to vaccinate and educate peasants in the 1980s. In 2001 and again in 2002 the country was hit by an outbreak of meningitis that killed hundreds of people and reached epidemic proportions in some areas; the worst such outbreak in the country's history, in 1996, killed more than 4,000 people. Only 32% of school-age children were enrolled in primary school in 1993, although the government later announced plans to increase enrollment to 60% by 2005. Burkina Faso is one of Africa's poorest countries, and per-capita income decreased in real terms by about 2% between 1985 and 1994. The economy is based upon agriculture and livestock (the second-largest export, shipped to neighbors in the south). Agriculture contributes more than one-third of the gross domestic product (GDP) and employs most of the labor force. Peasants grow drought-resistant crops such as millet, sorghum, and peanuts as well as cassava and rice. Cash crops include cotton, the leading export, shea nuts, and sesame. Low world prices forced the closing of the nation's largest gold mine in 1999, and other known resources, including manganese, remain largely unexploited. Industry (primarily textiles, artisanship, and small-scale agricultural processing) contributes about 20% of the GDP. Public administration, defense, and services (including the urban bazaar economy) constitute 40% of the GDP. Burkina Faso regularly imports far more than it exports  including much of its food. The trade deficit is financed by migrant-worker remittances and by foreign aid. Infertile soil, rapid population growth, and a lack of transportation and communications facilities continue to hinder economic growth. Recent development efforts have concentrated on the development of infrastructure (including hydroelectric installations), the privatization of unprofitable government-owned corporations, and the encouragement of foreign investment, especially in the mining sector. The Mossi arrived in this area in the 11th to 13th centuries and established powerful kingdoms, including Ouagadougou, Tenkodogo, and Yatenga. These linked kingdoms were centers of trade and contact between trans-Saharan traders and the forest kingdoms to the south. The Mossi strongly resisted the expansionist Islamic empire of Mali (12th to 15th centuries) and Songhai (14th to 16th centuries). France asserted control over the area in the 1890s, dividing it among other French colonies and reconstituting it within its present borders from 1919 to 1932 and again from 1947. A Mossi-dominated political party headed by Maurice Yameogo led Upper Volta to independence in 1960. Political life has since been dominated by the small educated elite, military officers, and labor unions. The nation's extreme poverty has made it difficult to meet the demands of all these groups, contributing to increasing political instability. Yameogo was overthrown by the military in 1966 after trade-union protests. Under the benign hand of Lt. Col. (later Gen.) Sangoulé Lamizana (president, 1966-80), Upper Volta enjoyed more civil liberties than most other African countries. It had a civilian legislature from 1970 to early 1974 and again from 1978 to 1980, when renewed union pressures and military impatience with squabbling civilian politicians led to a coup. A politicized officer corps mounted new coups in 1982 and 1983, when Capt. Thomas Sankara and a young, radical officer group seized power and sought to revolutionize society. Common people were encouraged to create Committees for the Defense of the Revolution (CDRs) in cities and villages through which to build schools and clinics, run local cooperatives, and exercise local power. The CDRs and Sankara sought to divert funds from the costly urban civil service to rural development, and Sankara came to symbolize popular democracy. A border conflict with Mali that sparked military confrontations in 1974 and 1985 was settled amicably in 1986. Disputes among the ruling group led to Sankara's assassination by his deputy, Capt. Blaise Compaoré, in October 1987. This act and the new military government provoked popular revulsion and anger. Marxism-Leninism was abandoned as the official ideology. A new constitution approved by voters in 1991 reduced the powers of the presidency and provided for direct multiparty elections. Compaoré and his party won the presidential election of 1991 and the nation's first legislative elections in 14 years, held May 1992. Compaoré's supporters won 101 of 111 seats in the May 1997 legislative elections. After the constitution had been revised to allow him to run for reelection, Compaoré won another term in presidential elections held on Nov. 15, 1998, that were boycotted by the major opposition parties. Early in 1999 the opposition called for an investigation into the government's alleged support of rebel forces in Sierra Leone's civil war. Later that year a committee of "wise men" convened by Compaoré in an effort to end the ongoing political crisis recommended the formation of a government of national unity. Compaoré revamped his cabinet in late 1999 and again a year later in an effort to meet continuing demands that he include more parties in his government. When new national legislative elections were held in May 2002, Campaoré's party (which had previously held 103 of 111 seats) barely retained its majority, with the remaining seats divided among a number of opposition parties. Bibliography: S. K. Asante, The Political Economy of Regionalism in West Africa (1985); Pierre Engelbert, Burkina Faso: Unsteady Statehood in West Africa (1996); Chris Howarth, Rebuilding the Local Landscape: Environmental Management in Burkina Faso (1999); Della E. McMillan, et al., Settlement and Development in the River Blindness Control Zone (1993); D. Raymond, Government and Economy in Upper Volta (1967; out-of-print); John R. Rennison, Koromfe - Descriptive Grammars (1996); Lawrence Rupley and Daniel M. McFarland, Historical Dictionary of Burkina Faso (1998); Robin Sharp, Burkina Faso: New Life for the Sahel? (1990); Elliott P. Skinner, African Urban Life: The Transformation of Ouagadougou (1974) and The Mossi of Upper Volta (1964; repr. 1989; out-of-print); Richard Vengroff, Upper Volta (1983; out-of-print). 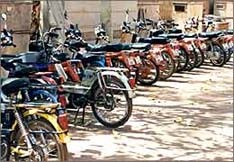 Images: Mopeds in Burkina Faso © BBC World Service. Is this a good time to call someone in Burkina Faso? Find out by checking the correct local time in the capital. Consult this valuable resource before traveling to Burkina Faso, to assess the relative risks of diseases such as African Sleeping Sickness, AIDS/HIV, cholera, hepatitis, influenza, malaria, meningitis (epidemic), rabies, traveler's diarrhea, tuberculosis, typhoid and yellow fever, as well as any other hazards and their preventative measures. The Federal Consumer Information Center offers information on passport and visa requirements for Burkina Faso. Full text reports on Burkina Faso's economy, including "Recent Economic Developments" and "Statistical Annex". According to the Ethnologue, there are over 60 living languages and dialects spoken in Burkina Faso, though the predominant ones are Mooré, Fulfuldé, and Jula. Despite being one of Burkina Faso's official languages, French is spoken by less than 1% of the population. The national literacy rate averages 19.2%. The non-profit, human-compiled database provides useful links about Burkina Faso, in both English and French. Created in 1969, the biennial Panafrican Film and Television Festival of Ouagadougou (FESPACO) has evolved into an internationally recognized and respected event. It became an institution on January 7, 1972 by decree in Burkina Faso, because of the enthusiasm and the hope it created among the public and filmmakers in Africa.